Cycling overshoes are a small, lightweight, effective, and practical accessory. They help improve many a tour on road bikes and mountain bikes. Feet are an important factor in the entire body's temperature regulation. If you have cold feet, your torso is probably freezing too. Cycling shoes in general have poor insulation abilities. Road bike and mountain bike shoes in particular have this problem. Their light upper material consists of mesh. Small covers made of neoprene or synthetic fibers solve this problem. They are windproof and water repellent, or even completely waterproof. They prevent excessive cooling. Find out below what you should know and consider when buying cycling overshoes. Like overtrousers and gaiters, overshoes for cycling protect against cold and rain. With cycling overshoes, you're well-prepared for Autumn and winter conditions, cold spells in summer and unexpected rain showers. 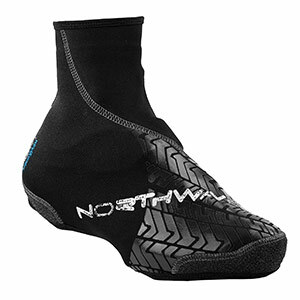 There are lightweight and thin types of overshoes for cycling as well as thick and robust ones. Generally speaking, you should choose a compact and light model for emergencies. You should be able to slip them on easily with a hook and loop fastener. There are cycling overshoes purely for winter that can be worn during the entire tour. They come with a zipper and should also have a warm inner lining. All cycling overshoes should have a large enough opening at the sole. The cleats from mountain bikes and road bikes should be able to pass through them. If you often release the pedals to rest or pass through hike-a-bike sections, it makes sense to have reinforcements at the bottom that are made of Cordura or some other material. Overshoes provide more security when they have enough reflectors or come in a bright colour. As for materials, you can choose between thick, robust neoprene models and lighter synthetic fiber designs. Neoprene is a particularly good insulator, it's windproof, and it's waterproof with taped seams. Most other models are furnished with a windproof and water-repellent membrane. They have either a lining or no additional insulation. Very thin cycling overshoe models are elastic. They have more visual and aerodynamic value. They offer very little insulation and aren't windproof. Instead, they're made for fast summer excursions and competitions. The shop contains quality cycling overshoes from manufacturers such as Shimano, Mavic, Vaude, Endura, POC, Maloja, and Giro.